Karl Chehade immigrated to Australia in 1949, and in 1957 began servicing the dry cleaning and tailoring requirements of Adelaide's elite. From his humble beginnings, Karl Chehade expanded the services and added more locations to provide extra convenience. Over the years a lot has changed, but not the family commitment to provide Australia with the most comprehensive, quality dry cleaning service. 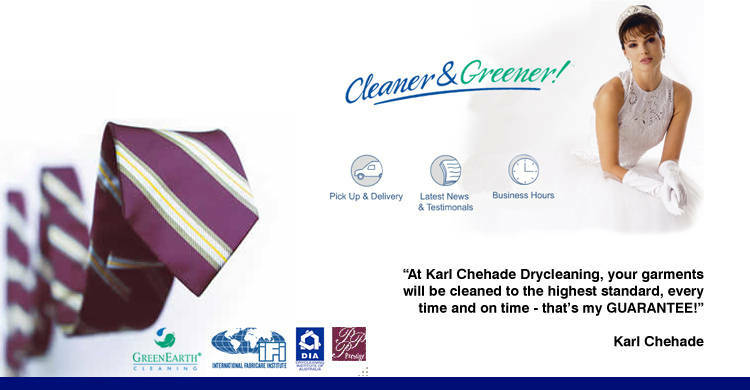 "At Karl Chehade Drycleaning, your garments will be cleaned to the highest standard, every time and on time - that's my GUARANTEE!" Make your life easier with Karl Chehade's FREE Pick-Up & Delivery Service - Dry Cleaning right to your door! Click here to Contact Us about our Pick Up and Delivery service. Click below to download our current brochure. Free Pick Up & Delivery Brochure. It's Right, It's Ready or it's FREE! 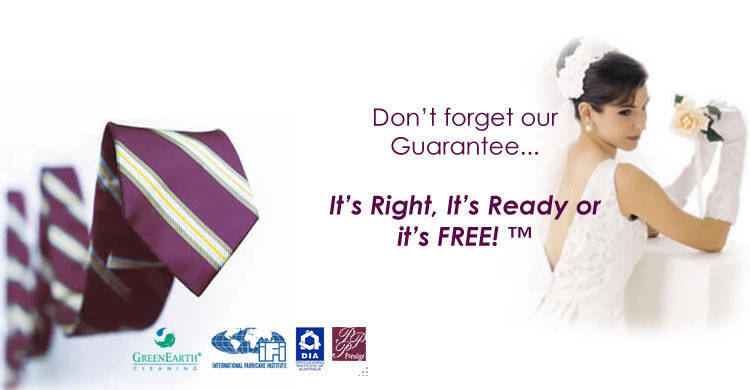 This guarantee is exclusive to Karl Chehade Dry Cleaning, and is central to our Mission. We undertake to professionally clean and finish your precious garments on time, every time. If for any reason it appears that one or all of your items may not be satisfactorily cleaned and ready on the agreed time, we will make every endeavour to contact you to notify you of the pending situation. If we do not contact you, the item which is not satisfactorily ready, will be cleaned FREE of any charge - no exceptions! KCDC guarantees that extra care and attention is paid to the safety of all buttons on every item left in our care. If for any reason a button is damaged or lost whilst in our care, we will unconditionally repair or replace the item, FREE of any charge. Garment Repairs & Alterations - from replacing zips & altering hems to relining jackets and remodelling outfits, KCDC provides a total garment maintenance service. Shirt Laundry - Crisp & clean shirts on time, every time! Leather & Fur Cleaning - Enhance the natural features of your most luxurious garments. You'll feel absolutely wonderful after wearing a freshly cleaned leather or fur garment. Curtains - Restore the brightness and remove unwanted odours and dust-mites from your most valuable drapes, soft furnishings and bedding. Bridal Gown Preservation - Your beautifully cleaned gown will be preserved to last a lifetime - Guaranteed! Fire and Water Restoration - Restoring items damaged through fire or flood can save thousands of dollars over replacement costs. Pure and Gentle - GreenEarth is remarkably effective and gentle. It is 100% odour-free, non-allergenic and non-irritating. Good for the earth - GreenEarth's unique silicone-based dry cleaning technology is safe for our water, soil and air. Wonderful for fabric - Your clothes will look newer longer with GreenEarth. Colours stay bright, fabrics feel soft. It's safe for fine silks, cashmere, wool, lace, beads, sequins etc. 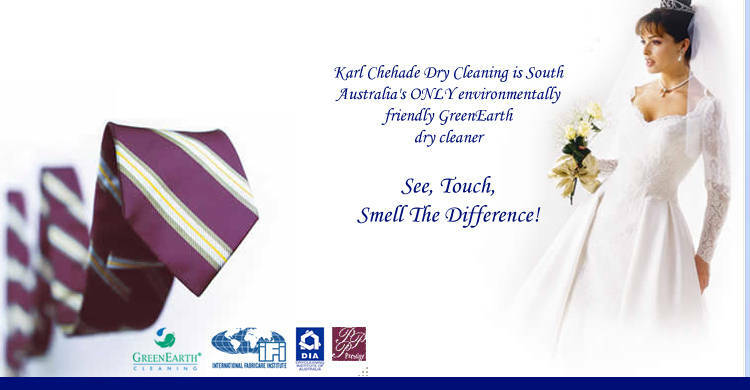 Karl Chehade Dry Cleaning is South Australia's ONLY environmentally friendly GreenEarth dry cleaner - See, Touch, Smell The Difference!